Built in the tranquil countryside of Cap Barbaria, Casa Preciosa nestles gracefully amongst the trees on a generous plot of 15000 square meters. This spacious contemporary house has a floor area of 140 square meters with numerous shady porches, and a lovely swimming pool to keep you cool during the summer months. And with wonderful views across the countryside to Ibiza, Casa Preciosa is the perfect choice for a fully relaxing holiday. This luxury Formentera villa will appeal to most with its homely furnishings and hippy-chic vibe. There are 3 bedrooms – Two lovely doubles with en suite bathrooms each with a bath and shower. One of the doubles has a dressing room and the other is in a gorgeous independent guest house. There is a children’s bedroom with four single beds and its own en suite bathroom. All of which are equipped with fans for during summer, and heating in the house for in the cooler months. The house has an airy lounge with fireplace, and a good sized kitchen/dining room perfect for cooking and socializing with friends. The kitchen comes fully equipped with oven, microwave, refrigerator, freezer, dishwasher, washing machine, induction hob, a complete set of tableware, Nespresso machine and toaster. The villa is equipped with wifi throughout, a 32″ TV with 50 channels, DVD player and an ipod dock so you can relax to your favourite tunes. There’s plenty of room to relax outside, with no less than 3 porches with numerous chairs, and couches to chill out in. Other features include a roof terrace for sunbathing, a fantastic swimming pool, and herb garden. Casa Preciosa is 5 Minutes by car to the beach (Cala Saona 2km) in the beautiful area of Cap Barbaria. 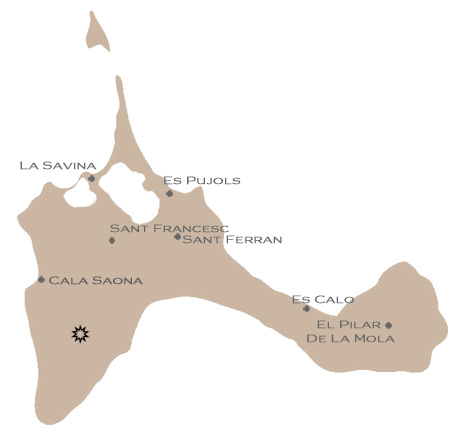 Cycle to the lighthouse or enjoy a leisurely shop at San Francesc Xavier where you will find restaurants and most facilities.